A Night at the Art Museum! “While the main course is traditional stand up comedy, expect appetizers and sides of improv, singing, dancing, and a sketch or two. The Lemon Bay Playhouse is the perfect intimate setting for our comedy buffet. And, it’s not just for, and about, women. We’re aiming for broad, adult, funny bone appeal with a bit of spice ‒ but no raunch dressing.” This show contains some adult subject matter and language. McSteen and fellow performers, Tara Zimmerman, Babs Vitale, Katie Style, Jacqueline DeGroot Wands, Lynn Lane, and odd man out, Daniel Cole, are all involved in the local stand up and theater scene. Appearances include Visani’s Comedy Zone in Port Charlotte, McCurdy’s Comedy Theater in Sarasota, Venice Theatre, Side Splitters, and Coconuts in the Tampa area. Two performers, Lynn Lane and Tara Zimmerman, are finalists in McCurdy’s 2018 open mic competition. Purchase your tickets now. You will not want to miss this performance. Lynn Lane is a retired educator from Minnesota who now lives in Sarasota year-round. She organized and hosts monthly Sarasota open mics at J. Dubs Pub and Subrosa, performs stand up at clubs and private venues, was a 2017 finalist in Visani’s First Comic Standing and won first place in McCurdy’s 2018 Open Mic Challenge. Kathy McSteen lives year-round in Venice. She’s performed stand up at Venice Theatre, McCurdy’s, private venues and placed in Visani’s 2017 “First Comic Standing” competition. 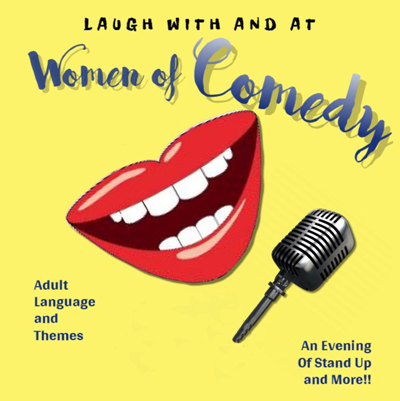 Kathy organized and performed in “Women of Comedy” last year as part of the Venice Performing Arts Center summer spotlight festival. Katie Styles is originally from Oklahoma but has called Tampa Bay home for the last 13 years. Katie’s performed at Sidesplitter’s, the Improv, Coconuts, O Brien’s Pub, Imorov U Theater, and Beef O Brady’s Comedy Cave. Katy is the proud mother of a 10 year old boy and enjoys spending time on the beautiful gulf beaches and saying horrible (but funny) things into a microphone. Babs Vitale is originally from Massachusetts and now a year-round Venice resident, Babs is a comedy dinner theater veteran who’s performed at Venice Theatre and Visani’s Comedy Club in Port Charlotte. Babs is developing a solo storytelling event and is part of the Englewood Dance, Etc. studio’s Halloween flash mobs. Jacqueline DeGroot Wands moved from Long Island four years ago. One of her childhood passions was acting. Here in Florida, she’s returned to the stage, this season in Lemon Bay Playhouse’s “Later Life,” the Charlotte Players’ comedic “Not Now, Darling” and “The Games A Foot,” as well as Venice Theatre’s ” Troupe in a Trunk” Educational Outreach program. Tara Zimmerman has made her husband of 27 years (Bob) and others, from Vancouver and New York City to venues around the Tampa Bay area, laugh for over a decade. She was a finalist in 102.5 The Bone’s “Last Comic Stranded” competition and McCurdy’s 2018 Open Mic comedy challenge. Reserved seat tickets are $15. There are no refunds for tickets. Exchanges are allowed up to 48 hours before the performance.